Are you running the Android L preview, but still looking to increase your Material Design intake? 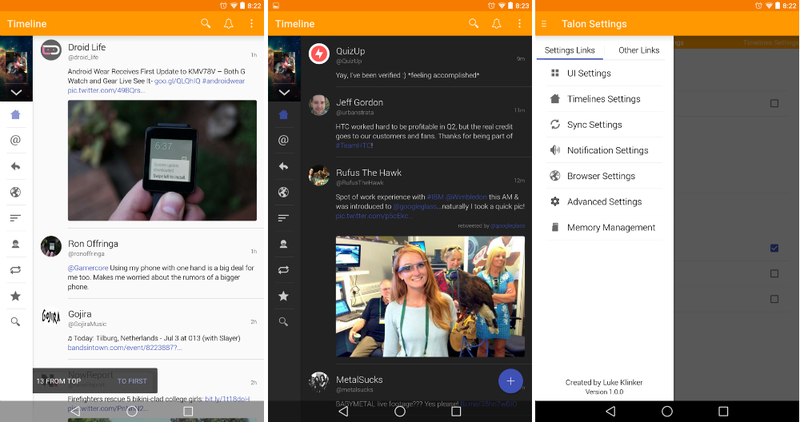 Well, the developer of Talon for Twitter has released his updated application, bringing Google’s new design language to life. This is one of the first applications we have seen to take advantage of the new guidelines, and so far, we’re impressed. The app features a nice and bright timeline, but also gives users the ability to switch to a blacked-out timeline if they so choose. As for what’s changed between the current Talon and the Talon for Material Design, the developer has introduced a floating button, which allows you to create new tweets. Animations have been freshened up, and there is also a new tweet pop-up, which displays pop-up messages when tweets are received. Unfortunately, only folks running Android L can install this application. If you are running anything older, such as Kit Kat or Jelly Bean, the developer says don’t bother. Besides, while parts do look good, the app certainly features a few bugs. It is only a preview at this point, much like the OS it is running on. If you want to try it out, sideload the apk file by downloading it from the link below. Thursday Poll: How Much Would You Pay for the Moto 360?